At this time, the initiates are considered to be newborns. They are persons who, even though they have just received a great power, are in a fragile process of purification. That’s why they must dress entirely in white and always wear protective head gear and clothing to protect the feet and the back. This includes everything from caps, stockings, closed shoes, skirts and shawls for women, even walking-stick parasols. The “layette” of these initiates refers to morality and social projection. Such customs have nothing to do with fashion trends and they form part of the sacrifice the person undertakes with pride. 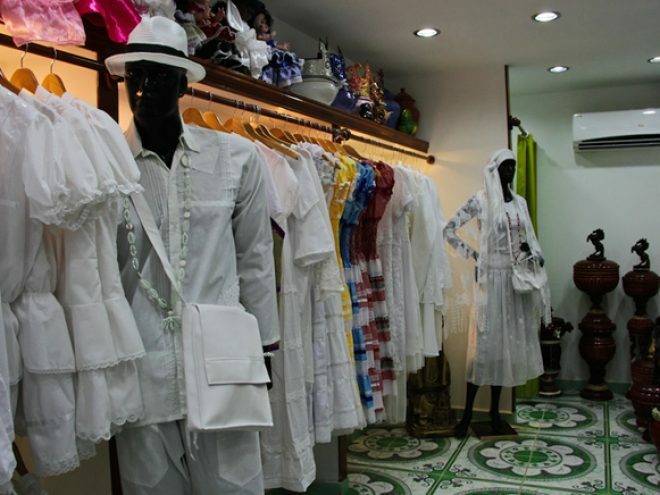 On many Havana streets, you will find private stores that sell this kind of clothing. Even though the dress code is quite strict, the way of wearing white as well as the ritual and the “being Iyawó” gets established depending on each “house of saints” (casa santoral) because, as the saying goes, “every person writes their own ticket.” Within all these customs, however, certain esthetic tastes can be identified: women prefer lace shawls, pantyhose or ankle socks with frills and embroidered skirts. Men use pointy shoes, berets, sports caps, long sleeved shirts, guayaberas, kerchiefs, etc. It’s no news that wearing all these clothes is a serious challenge during the long hot Cuban summers, and whoever wears it stands out in any crowd. These articles are a reflection of a recycled esthetic that belonged to the rules of being well-dressed in the mid-twentieth century. There is a certain vintage feeling to all this brilliant white. The initiation period for an Iyabó is divided into different periods according to the ceremonial phases characterizing them. They are cleansing and purification ceremonies that eliminate the rigidity of the clothing after the first three months until finally the year has passed and the person is considered to be grown up and can abandon the regime. Iyawós then start mixing articles of clothing with colors, such as blue jeans, and the women use ribbons in their hair instead of headscarves. Some even assume behavior that is less accepted by the religion such as using shorts and low-cut blouses or t-shirts. Many Iyawós also start to personalize their clothing with small white handbags, white Ipods, white headphones, white wallets, white earrings and even white SmartPhones. A certain baroque element is also introduced with the wearing of multicolored necklaces that denote the santos they have received, often up to a dozen at a time. The special necklace that announces the guardian angel always matches the bracelet or “iddé” worn on the left wrist. Nowadays, the designs are undergoing modernization. Materials used in the religious costume jewelry have started having more “bling” and sequin decorations, and the beads emulate Swarovski crystals that are symbolic of popular luxury. When the year ends, the worn-out clothing stops being the rule. Many never wear them again. Some will just put them away in some drawers while others will show them off to family and friends, or give them away. What is certain is that after the party and the offerings to the gods have come to an end, the clothing remains as evidence of the sacrifice. And although I am not Iyabó, I wear white, and while I walk around Havana, I enjoy the blessings of those who have made this style a cult. September 2014 This article formed part of the septiembre 2014 issue of What’s On Havana The definitive monthly travel & culture guide to Havana Download our current issue of What’s On Havana, your definitive travel, culture and entertainment guide for all things happening in Havana, Cuba’s bustling and enigmatic capital city. We include features from around Cuba written by the best international travel writers covering Cuba. Our monthly online digital magazine is also available in Spanish and French.